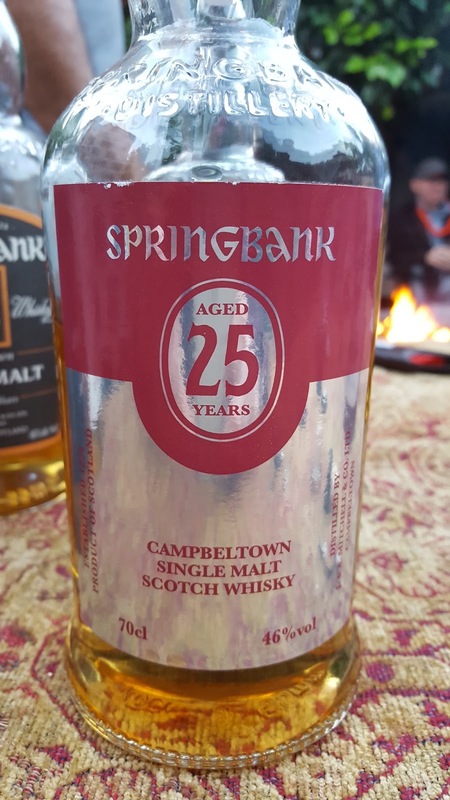 In November 2014, Springback Distillers announced a release that marked a milestone in their distillery's modern era, a 25 year old single malt. Though there were sporadic distillations run since 1979, the stills didn't resume regular production until 1989, so the 25 year old whisky was being pulled from the earliest months of this new period. Springbank didn't restart their floor maltings until 1992, so the early washes were from sourced malted barley. The color is light gold, a good sign. The nose begins very fruity, think kiwi, peaches and lychee. There's some dusty oak and roses. Maybe some grain. 20+ minutes later... Hints of farmy peat, caramel candy, strawberry candy and maple play hard to get. The palate feels very light, and a little soapy. Slightly mossy with a strong bitterness. Some cocoa and roses. Burnt wood, burnt peat. Hints of tar, cardboard and something chemical. A strong dried herb note shows up in the finish. Bitter, burnt, soapy, sweet, fruity, tarry. I......um......This was worse than the cynic expected. I actually agree with Serge on this, even though our palates take to port maturations much differently. It's just not very good whisky, which comes as a shock to this Springbank geek. It's not bad whisky either, but I can't think of a single official bottling of theirs I liked less. The subtle but pretty nose keeps the whole thing out of the C-grade range, barely. The palate feels younger and crooked, but not in an enjoyable way. The problem isn't the port casks, surprisingly. They did nothing here, except inject a little fruit and cocoa, if I'm being generous. I fear the distillery had a handful (or fewer) casks that survived the quarter century, and stayed at a respectable and legal bottling strength, but were really not honey barrels. Judging by the current 18yo-20yo single casks selling for nearly $300, and the 21 year old single casks selling for closer to €400 in Europe, one begins to wonder why the 25 year old release hit the market at only £350. We're they trying to make the 25yo more affordable (whatever that means these days) for their loyal fans? Or did they know this wasn't their hottest ticket? Yes, in the US it costs almost twice (or more!) than what it's going for in Europe, but that's just yet another importer issue. Whether it's selling for $450 or $850, I do not recommend it. I'd say get a case of the 12 year old Cask Strength bottling (and if you're in the US, you'd be able to throw in a few additional Longrow 18s too), if you really want to spend that kind of crazy money on Springbank stuff. Or you can just buy one bottle of the 12yo CS and then ponder your next move in the world of distilled spirits. –The whiskybase community is orgasmic about it, but I don't see any grades from the veteran guys I've grown to trust, there are at least two high grades by people who are or were selling bottles, and only 2 of the 86 raters wrote reviews of their own, so take that as you may. –The LAWS guys, who sampled from the same bottle as I, give it a mix of B- and B grades. –Ruben of whiskynotes gave it an 86, but wasn't impressed. –As referenced earlier, Serge gave it a 78. Springbank is one of those distilleries where I just wouldn't trust their old stock anymore because there's no way they have the depth to construct quality releases (see, also: Talisker). There might be some good old single casks in there, but anything more than that just seems like scraping together what they can find. I kinda think they just barreled what they had, as long as they could keep it above 46%abv. Maybe even a sub-40% cask in the mix. If this 25 was any sign of what remains, then I hope they wait to do a 30 year old release until they have the depth you'd mentioned.